Mike Paustian always knew he wanted a career in agriculture. His passion for animal research began in high school. Today, he combines his practical experience with his education to make sure his family’s livestock are well cared for every minute of every day. He’s vigilant about this effort, and it shows in every aspect of the farm. 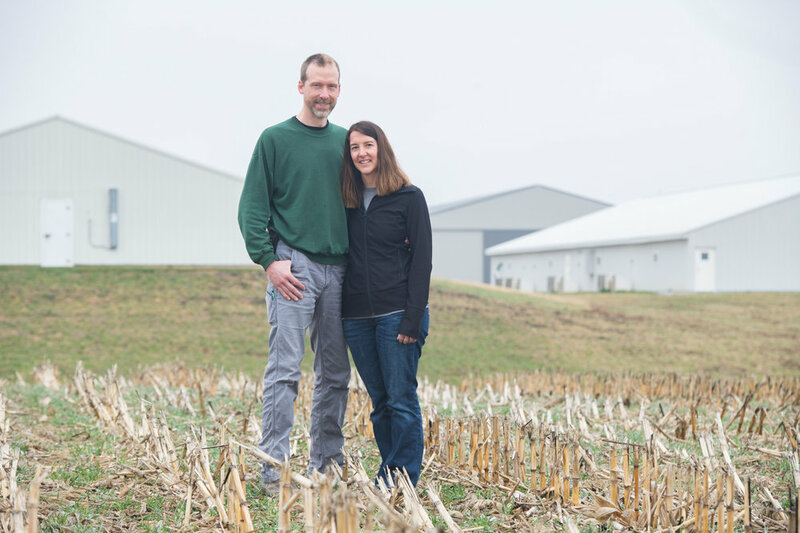 Along with his wife, Amy, Mike is a sixth-generation farmer, operating a sizeable farrow-to-finish pig farm as well as growing corn and soybeans. The Paustian’s farm, which started in 1856, is a truly a multi-generational operation. Mike’s parents, Kent and Marcia; his uncle, Ross; and cousin, Tom; are all also actively involved with the farm. Mike’s journey of working on the family farm didn’t begin straight out of high school. After completing undergraduate work at Iowa State University, he earned a Ph.D. in microbiology from the University of Minnesota. He then spent several years working on animal disease research at the National Animal Disease Center in Ames. “For as long as I can remember, I always wanted to do something that benefited agriculture, which is why I worked in disease research. If I wasn’t directly on the farm, I knew I wanted a career doing something to help farmers,” Mike explains. Today, as president-elect of the Iowa Pork Producers Association, he uses his understanding of scientific findings to help address issues facing pork production both on his farm and other farms. Whether it’s mitigating potential diseases or enhancing livestock comfort, he is eager to learn from others and share his experiences. Mike’s wife Amy also grew up on a farm. After their children were born, they wanted to give their kids the same opportunity. “We wanted to help maintain the connection to farming for our kids. It often only takes one generation of being off the farm to lose that connection,” Mike says. While their kids – Zach (15), Elizabeth (12) and Madeline (9) – are still in school, they’ll be seventh-generation farmers if they choose to farm as a career. As livestock producers, everything the Paustians do is to provide the best possible care and comfort of the animals. “We don’t want our pigs to have a single bad day. We never want them to be too hot or too cold, too hungry or thirsty. 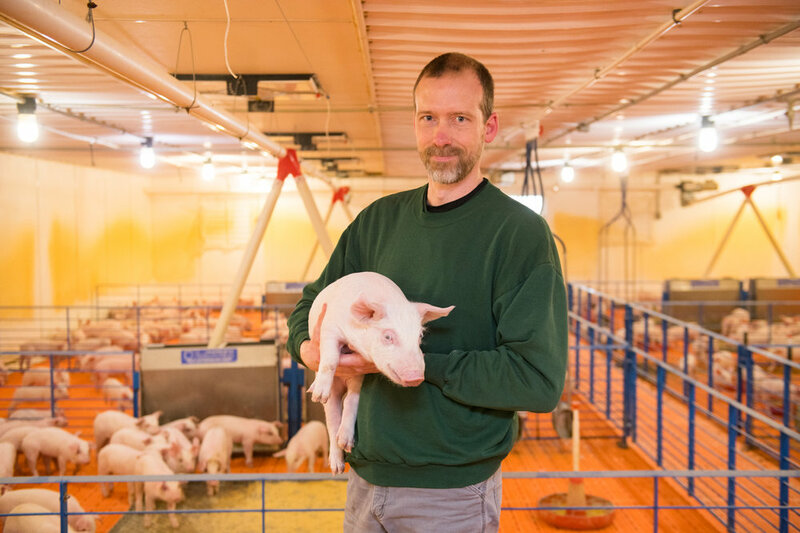 The more comfortable and happier we keep the pigs, the more successful we’ll be,” Mike says. The family knows their success is dependent on caring for livestock in the best possible way. It’s their livelihood, and there’s not a lot of margin for error. “If our livestock aren’t thriving, we won’t have an economically sustainable business,” Mike adds. The Paustians are passionate about the role of continuous improvement in helping their pigs thrive. With a veterinarian and a nutritionist as part of the team, any modifications are always well thought out and backed with science. The Paustians limit traffic between their farm and other farms to be sure external contaminants don’t enter the operation. They have a feed mill on site which crushes corn into pig feed, providing economic benefits and supporting biosecurity. “We grow crops for feed, and the hog manure is used for fertilizer. It’s truly a sustainable system,” Mike says. Technology plays an instrumental role in the way farmers take care of the livestock. But it doesn’t replace people. All barns have internet access so the pigs can be monitored 24/7. The controls show the building’s temperature and how much water or feed is being consumed. In the summer, fans – circulating fresh air – and water misting systems keep the modern bars cooled to precise temperatures, and in the winter, heaters run to maintain desired temperatures. Proper temperature settings are vital to each pig’s ideal comfort and vitality. Technology won’t stop there. It won’t be long before cameras are in barns essentially tracking every single pig, all day long. Farmers would know precisely how many times each pig went to get a drink of water or eat. The concept would be to help flag certain pigs, who may need additional attention. In 2015, the Paustian family won the Gary Wergin Good Farm Neighbor Award. The Wergin Good Farm Neighbor Award presented by the Iowa Department of Agriculture and Iowa Ag Radio Network in partnership with the Coalition to Support Iowa’s Farmers is presented nine times annually to an Iowa farm family who raises livestock. The award is given in honor of distinguished WHO Radio farm broadcaster Gary Wergin and recognizes families who take pride in being good neighbors and stewards of the land. The family was nominated for the award by Will Moon, president at the Iowa-80 Group. With more than 2 million customers a year at the “World’s Largest Truck Stop,” the family farm is just 1,600 feet from their corporate office. When a neighbor nominates a farm of this size for a “good neighbor” award, it must mean the family is doing something right. The Paustians continually pay it forward.